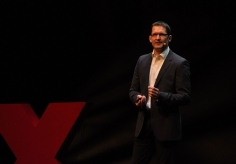 Peter Speyer, Director of Data Development, presented IHME’s work at TEDxRainier, Seattle’s annual TED (Technology, Entertainment, Design) event. In keeping with this year’s theme, ReThink, Speyer discussed how policymakers, researchers, and communities can take the next steps to turn disease burden evidence into action that will have a real impact on health. At the event, Speyer announced the launch of the Roux Prize to reward use of Global Burden of Disease evidence to improve health. The Roux Prize is a new US$100,000 award to recognize individuals or groups that have used Global Burden of Disease data to take action that makes people healthier. For more information on the nomination process and criteria, please visit www.rouxprize.org.